Can the New H1B Visa Rules End Fake Resume, Lower Wages & Abuse? Please note: This New H1B Visa requirements are not the same as a minimum 130k salary rule that’s been widely talked about and you can find more details about the bill below. What is USCIS Questioning in H1B Application? USCIS has been issuing an RFE for H1B Visa petitions filed by IT Service providers who place their workers at Third Party worksites. Here’s what USCIS was questioning via a Request For Evidence (RFE). Since the memo was published and there’s not a lot of buzz about the New H1B Visa memo. I think the Neufeld Memo of Jan 8, 2010, which required Employer-Employee Relationship for H1B workers had more buzz than this current memo. As per my interpretation of this memo, New H1B Visa applications, H1B Visa extension, H1B Visa stamping, H4 Visa stamping, could require additional documentation for employee’s working at client locations through service providers. The impact of this memo is probably not yet fully realized from the news articles discussing the memo (Read it from CNN, News Week) from the surface level. You will see several posts going forward, just the example listed below from the F1, OPT H1B Visa Facebook Group. And, it doesn’t stop right there. You have seen stories of employers withdrawing petitions because they couldn’t respond to RFE’s because of the nature of RFE request and ability of employer to respond to request with supporting documents. My H1B extension is in progress. I got an RFE for my petition and I do not feel confident enough in getting an approval. My current H1B Visa expired on Oct 31st and I am currently working on the H1B extension receipt number. I have to respond to the RFE by Jan 31st and I have only a week to decide on my options. I would like to know if can initiate a transfer process with some other employer before I get a denial. What would be my situation if I get a denial and how long can I stay in the United States legally? So, what’s included in the RFE, who does this impact and what are the new documentation requirements? I’m sure, you have been reading about End-Client letters and service contracts through RFE and via 221 (g) at Visa Interviews for H-1B Visa Stamping are various U.S. Consulates around the world. USCIS has been issuing RFE’s requiring End-Client Letter and itinerary details via RFE, but they have formalized the requirement by publishing as a memo with clarifying the additional documents required as part of an H-1B Visa application. 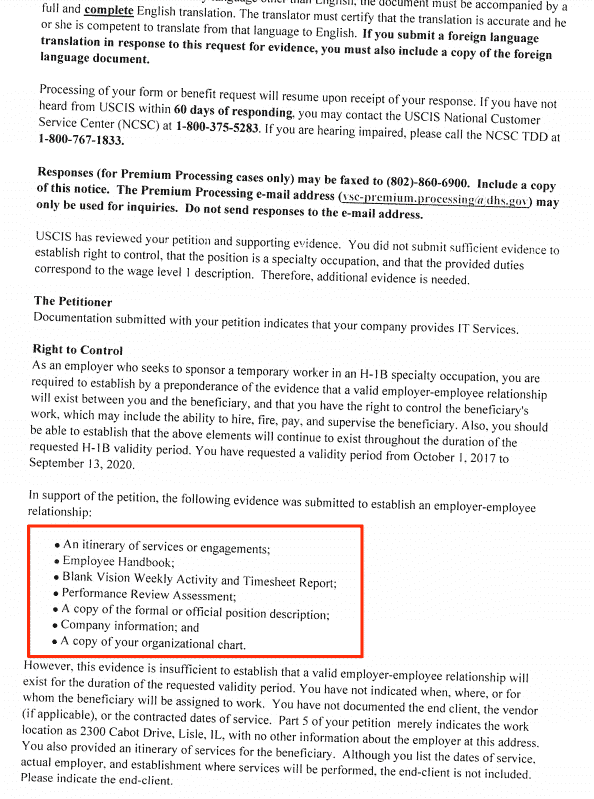 So, in order to verify relationship exists and to prevent violations like abuse, wages and working conditions, USCIS has issued RFE’s and now they have clarified the expectations from the Employer while filing H1B petitions via this Memo. USCIS, agrees that placing workers at a third party site is a legitimate business model, but when there are multiple vendors involved between the employer and the end-client, it becomes difficult to establish if there’s an employer-employee relationship. Question: Does this New H1B Visa Rule include a minimum salary of $130K? They are totally different. This H1B visa memo from USCIS specifically targets IT Body shops (like Infosys, TCS to small vendors) who hire employees to be placed at third-party sites. What’s Happening Today with H1B Visa Approvals? USCIS is issuing RFE’s to request additional document to validate of the if Speciality Occupation will be performed at the End Client. Petitioners who regularly place their workers at third-party worksites often submit uncorroborated statements describing the role the H-1B beneficiary will perform at the third-party worksite. Such statements by the petitioner, without additional corroborating evidence, are often insufficient to establish by a preponderance of the evidence that the H-1B beneficiary will actually perform specialty occupation work. Now, you know what’s required for H1B Visa approval for a contract worker. And what additional evidence is required from the employer before USCIS can approve the H1B Visa petition. I have received an H1B RFEstates “Right to Control Employer-Employee relationship and specialty occupation”. I was on this project as a Contractor when the petition was filed, but now my contract is finished as my current OPT extension period expired. I am worried about getting denial as this is only my hope being last chance of getting an H1B Visa. Apart from this my employer is not sure about the RFE response and stating there is minimal chances of getting approved. Now, let’s look at what’s new requirements and its impact on New H1B Visa Applications, H1B Extension and New Employer Transfer Applications. What’s New in H1B Visa Memo from USCIS? Contracts as evidence to demonstrate the employer will maintain an employer-employee relationship with the beneficiary for the duration of the requested validity period. Now, you may wonder, that sounds good and should be easy for employers to obtain above documents. Here comes the twist! Copies of detailed statements of work or work orders signed by an authorized official of the ultimate end-client company where the work will actually be performed by the beneficiary. The statement should detail the specialized duties the beneficiary will perform, the qualifications that are required to perform the job duties, the duration of the job, and the hours to be worked. Now, let’s compare the above requirements with a sample RFE for H1B Visa petition requesting the employer to prove Employer-Employee Relationship. Click on the image to expand. If you look carefully, you will see the documentation requirements listed in RFE’s are listed in the Memo, but there’s two more additional requirements from the Memo (#3 and #4). It’s listed below and pay close attention to highlighted text. I think, above authorized signature requirements could be the game changer to avoid abuses and probably difficult to get for every employer and employee’s. What do you think? If you are working as a contractor, can you comment on this? Corroborating evidence for all of the above. Typically H1B Visa would be approved for 3 year period. As per new Memo, approval period could be based on the documentation provided as part of the petition. USCIS will, in its discretion, generally limit the approval period to the length of time demonstrated that the beneficiary will be placed in non-speculative work and that the petitioner will maintain the requisite employer-employee relationship. While it may be difficult to get signatures from the End-Client, this new memo applies to H1B Extensions, New petitions, and Previous Employments. Yes, you read it right – Past Employments working as a contractor with the same petitioner. As you can see, USCIS is looking back at previous client engagements to see if the conditions for H1B Visa were satisfied. Wouldn’t you agree this would help H1B Visa system abuse and fraud. These are my views and consult your employer and Immigration Attorney to know how it personally affects you and your family. Some of my views are listed as questions (I don’t know what could happen). Would the End-Clients willing to sign the required details? Increase in denials of H1B Visa applications from IT Service providers if required documents can’t be provided. With End Client contact details, USCIS could ask the End Clients for a copy of your resume (Beware of Fake resumes). Applying for H1B Visa without actual projects would be difficult, if not impossible. Processing delays if the required evidence is not considered as corroborated. U.S Consulates could ask for the same documents during the visa interview. Delays in Visa approvals due to Administrative processing. Pending H1B Visa petitions could get an RFE for additional documents. H1B applicants who were planning to apply via an IT service provider as backup to primary job might not be possible. Memo applies to all workers who work at different client location. So, this could affect Management Consultants, Sales and Marketing professionals, etc. 1. I’m working full-time with direct hire and not end-client is involved. Does this memo impact me? As far my understanding of this memo, this impacts IT Service providers who place employee’s at End-Clients. 2. My H1B Visa extension is pending. I have been working as contractors for a small design consulting company for past four years, how does this memo impact my pending H1B Visa extension? Your best resources are your employer’s Immigration Attorney and your Employer. Talk to them. They should have started preparing for additional documents required by USCIS. 3. I have questions that I can’t ask my employer’s attorney the impact of this Memo on New Job offer for an IT consulting company, who should I talk to? Please talk to a qualified Immigration Attorney about switching jobs from one consulting company to the next. You can also use Ask an Immigration Attorney service offered via Happy Schools as well. 4. Is there a minimum salary of 130k included in this Rule? Minimum salary of $130k, $120k or $100k have been introduced as part of several H1B Visa Bills. They are yet to be implemented as a law. There’s no changes to minimum H1B Visa salary as part of this new H1B Visa rules in 2018 as per this memo. 5. My wife is going for H4 Visa stamping. How can this memo affect her? In the F1 Visa, OPT and STEM OPT, H1B Visa Group, there is increase in posts about Administrative Processing – 221 (g) after H1B and H4 Visa Interview. Your attorney is your best resources to discuss the impact of this H1B Visa Rule on upcoming Visa Interviews for both H4 and H1B interviews. You could connect with folks waiting on 221(g) to learn more. What do you think about this new policy from USCIS? Is it a good move to prevent H1B Visa system abuse? Will this new memo impact visa stamping process also for extension? Talk to your attorney if you are going for stamping. Consulate *could* ask for additional documents. It’s always better to take additional documents than required to be on safe side right? Do you see an impact on the expected number of applications this year? Would this reduce the number of petitions significantly? 1. Worst case, the application would be selected in the lottery and denied by lack of documents. If it’s going to be selected, why not give it a try? 2. If companies want to be cautious, they wouldn’t apply to folks without any project (say H4 to H1B or applying for India). I am experienced garments quality manager in Bangladesh , looking for a job visa in USA or Canada . Finally USCIS gets it right. I had to almost go home since i had 1 application as i was a direct hire and getting paid more than the consulting companies like wipros and cognizants while market was being flooded with applications, while being on OPT. Good way to stop the abuse! My employer is a vendor and I work for one of its client. Does this impact ?? If you work at Client Site (not at Employer), then this memo would apply to you.